Long time no update.. I'm so busy with Ramadhan routine. This is my first Ramadhan as a wife. I have to get up at 02:30 AM everyday (my husband always waking me up, because it's so hard for me to get up early XD), preparing meals, sahur, praying, sleeping again. Then I have to get up again at 06:30 AM, take a bath, prepare my stuffs and go to the office. Hoaaahm… have a lack of sleep... Eyebags & dark circles look very clear on my eyes @_@. Pimples everywhere because of my hormonal illness. But the good news.. I gain weight! You can see my cheeks, so chubby!! XD No, I'm not pregnant yet. Anyway.. I went to "Pasar Senen" last Saturday with my best friend, Asih Jenie. It is a flea market. We were hunting some stuffs. 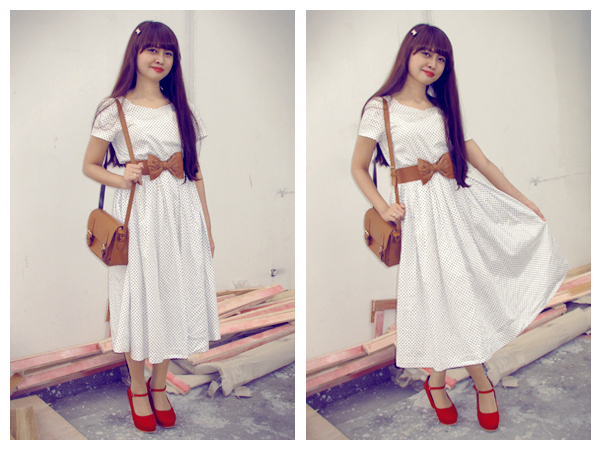 I tried to focus in searching the vintage dress(es), and I got it!!! I bought 6 dresses, 2 knitted cardigans, 1 floral skirt, 1 polka-dot skirt and 1 denim backpack for only around IDR 350.000!!! HOHOHO!! Well done! And because those stuffs are preowned, I washed them many times (with lots of detergent) until they are totally clean. And yaay! They still look nice and good! 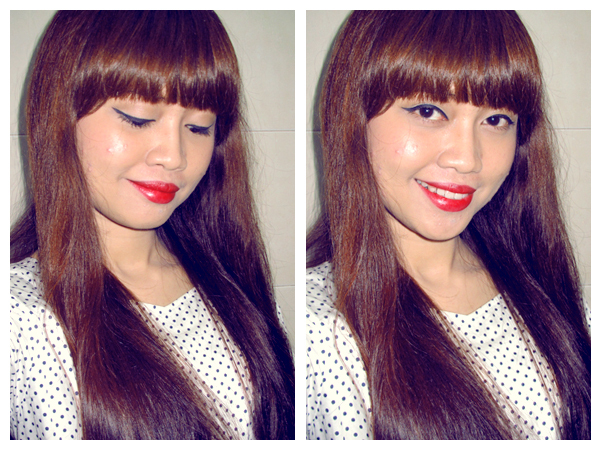 This is one of them..
And here is my FOTD, vintage look with red lips (MAC Lipstick - Russian Red). 1. Wear simple outfit such as t-shirt, shorts and sandals. Besides it makes you more comfortable (it's very hot in there, there's no Air Conditioner), it also make the trader thinks that you are a college student. So they will give you the cheaper price, hahahah.. It happened to me and Asih Jenie. LOL. 2. Focus on the list. Make sure you write down what you are looking for there. Dont' stop only in one booth. 3. Bring lots of cash. It's so hard to find the ATM there. 4. Be careful your stuffs (cell-phone, pocket, etc..), because people say there's a lot of pickpocket. 5. Bring some shopping bags (more than one), if you don't want to be bothered by black plasticks when you go home XD. 7. Check the stuffs carefully. The color, the zipper, the size, is there any hole or not, etc.. If you are lucky, you could find the original branded stuffs there! I was so happy when I found some stuffs that I want there. I plan to go there again next time to search some more vintage outfit. Hoho..
BTW. My office mate told me about this psychedelic rock band and I fell in love! Nisa> Itu bikin nis di pengrajin sepatu, waktu itu dia buka stand di bazar deket tempat tinggal gw. 2 mingguan jadinya.. diambil di stand dia lagi ^^ Soalnya dia belum punya toko tetap.